Lydia is 11 years old now. I’m guessing she must have been seven or eight when she went a little bit crazy with a green highlighter on the pages of her Bible. She marked up page after page, line after line, in her first “big people” Bible. It happened a few weeks after she got it. She must have done it under the covers, after we tucked her in and turned out the light. She could read by the glow of her night-light, I suppose, and maybe with the little numbers on her digital clock. Those numbers cast a soft, red glow from her night stand. And while we thought she was sleeping, she had flipped pages of Scripture, marking thousands of words in green. I asked Lydia later why she did that, why she marked all those words in green. And she said it was because of what I’d told her. Her favorite part was … well, all of it, I guess. I’ve marked my Bible plenty over the years. I’ve highlighted favorite passages, a psalmist’s beautiful turn-of-a-phrase, some bit of Scripture that pulled me out of a pit. God knows I’ve cried big, fat tears while streaking that green highlighter across the page. But what Lydia had done? It was different. 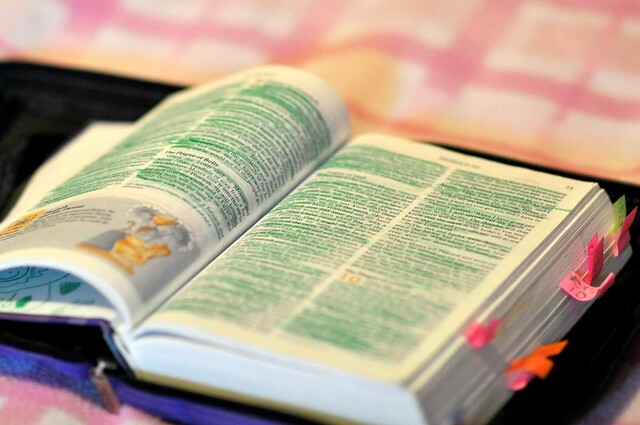 She had marked about half of Exodus, huge sections in Matthew, whole paragraphs in Genesis and a chunk of Scripture in Acts that she’s particularly fond of. She marked the story. Not the perfect endings — but the painful middles. She marked the plagues, and the parts about Passover, and the wailing in Egypt. She marked the hard parts, the scary stuff, … and also the celebrations and the promises. It’s a wild story, and yeah, it’s a bit unruly. There are these huge gaps between the happy verses. Some of it’s deep valley-ish. Some of it’s highly mountainous. But it’s still God. It’s His Story. And now? It’s all green. I don’t know. Maybe I’m overthinking, over-spiritualizing, over-sentimentalizing things. I’ve been known to do that. I mean, she could have been just another little kid who got a little bit crazy with a highlighter, a kid who wanted to see what it would feel like to mark page after page. Except that she said it wasn’t like that at all. I don’t know why this hit me the way it did, but I’m sitting here misty eyed at the simple beauty of this post. How Lydia loves His Story and sees Him in the whole of it…there’s just something amazingly special that He has for that girlie of yours. Ah. We should never know where to stop in His Story. Never. Mark it up! Black and white and covered in green! How beautiful, I shall never look at a Bible and its notes the same again…thank you. Growing up, I thought that maybe Bibles shouldn’t be marked. I don’t know why, really, other than the fact that the words were so sacred. My mom didn’t disallow it. Because I see now that my mom had been marking hers up. How about you? Did you feel comfortable marking in the Bible as a child? Actually I do remember underlining one of my first Bibles as a nine year old. I would carefully use a bookmark and a pencil (must have had a little OCD tendencies!) and make those lines as straight as I could. I most usually chose the Psalms. My grandmother wrote in hers so I followed her example. She also wrote in the margins, the date of a sermon, who was the minister, or the title. I remember doing that for a while too but got away from it. It’s too bad too because I think it would be a treasure for my children in years to come as hers is to all of us. Great post! Oh, your Lydia and my Hannah could be soul sisters. I’ve thought that a dozen times as I read the tales of your sweet girl. Hannah used to sleep with her Bible right beneath her pillow because she “wanted to hear Jesus talk to her in her dreams.” I think your daughter loves the story because her mommy lives the story so well! Thanks for being you. Alicia … the Bible under the pillow? So tender. Love that Hannah-Heart. love her breaking open to story. such a beautiful gift to watch another soul expand. you do such honor to it here, as always. Beautiful! 🙂 Makes me smile reading this today, Jennifer. What a precious heart that Lydia has for God’s story. May she keep it always and may her joy be contagious. Thanks, Lisa! Looking forward to reading your #TellHisStory this week. She is such a sweetie pie!! Yes, they like to do what they see their mommies do. It places such a big responsibility on our shoulders, don’t you think! Come to think of it Jennifer, the Bible tells the story of Jesus and his great love for us. 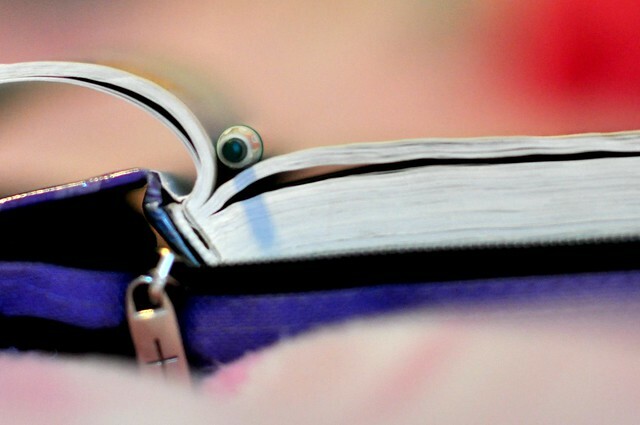 I mark the parts that talk to me in the season I’m in and when JESUS LIGHTS up the WORDS for me and I get attracted to that part of the chapter and book. What a precious memory! And what a deep revelation in it. This got me thinking: “The story is my favorite part. How it all goes together” Perhaps not about this, but a nice reminder that no matter how bleak it might look right now, God isn’t finished with my own story yet. I’m a recovering don’t-write-in-your-Bible girl. Growing up, it was not encouraged. I don’t remember if I was actually encouraged not to, but from from my memory of having to make a paper dust cover for my Bible (making it look like any other text book, in my mind), the message was “keep it clean.” It was a HUGE hurdle for me to get over. HUGE. Hurdle. There’s no way I’d go back now. My daughter has done what your Lydia did, highlighting sections, rather than key verses. I don’t think I ever asked her why because, well, I’m still in recovery. While I was trying not to have a heart attack, I was trying to let her do her own thing and not give her the impression that the Bible was hands-off. Thanks Michelle, I think we need all the encouragement we can get! This just makes me smile all over. When I was her age, I had a set of highlighters and I used different colors for different things. But I like Lydia’s way better. “I didn’t know how to stop.” That is the way of His Story when we actually delve deeply. How can we stop kneeling before this God of ours Who indwells us and loves us even when we mark up His Book with green or any other color for that matter, when we fall away, when we cry, when we suffer. He never leaves us and when I realize that again and again, I, too, just can’t stop! Just as Lydia marked up the hard stuff and the beautiful stuff, we live through those moments with the One Who holds our hands. Thank you for a beautiful story, Jennifer. Really beautiful! Where I come from, we are in a period where we have an “extra focus” on what children mean to God. About how children are the next generation, and that this generation will matter even more than ours in the world. BUT, though it is important to equip children for when they grow up and will make a change, it is important to see, encourage and equip them for today. God will use the children today, he is not going to wait until they grow up. He uses them to do his work, just where they are today, just how they are right now. I have a little girl, and for me that was a new thought, but lately I’ve been looking more closely, and i find that God is using her already, even though I haven’t “been good at” reading in the bible with her, telling her story’s, praying with her too much. I’m changing that right now, because I’ve seen what God can do with a four year old, without me equipping her. This story that you shared is powerful! I can see so clearly how god used Lydia, spoke to her in HIS way, and gave her that wonderful perspective on things. It is really special that what she loves and pays more attention to is the stories. Is it a connection with her mom arranging Tell his stories every week? You’re both blessed with a view of things that many tend to forget -the importance of the story and what the story can tell us. Wow, This post was just so beautiful and inspiring to me -it sort of just proved to me once again how powerful God’s work in the children are, and how important it is to keep encouraging them to seek God, exploring His kingdom! Thank you for sharing. Bless you and your family. Hi Jennifer…What a wonderful story of Lydia’s discovering The Stories contained within the Word. What a girl! I came to Christ later in life, (age 30), and your writing today reminded me of when I first started reading the Word. Coming from a highly dysfunctional family, I was amazed and astounded at finding Truth within the pages. All I’d ever known was lies. His Word was fresh spring-water to me, and was just so poetic and exciting and amazing. I did not even know how parched I was, until I came to The Living Water. I highlighted, I studied, I wrote note after note in the margins. I’d never seen a marked Bible until I entered the church. You should see the finger marked pages of Ephesians chapter 1 in my first study Bible, with underlining, arrows, scribbled notes crammed between lines! I once had an elderly man, sitting next to me in Sunday School, lean over and say, “I see you’ve studied Ephesians before!” I’ve now moved on to newer Bibles, but that old burgundy leather NKJ Open Study is still my very favourite. It’s the one I return to again and again. I pray Lydia (and Anna) ALWAYS find fresh spring-water in every passage they read, even under cover of night. Just like their Momma. Your girls are amazing! I know God has big plans for them. This is a delight Jennifer! I love how you tell a story. You make me want more…more of Him. I still call myself a somewhat new believer and seeing the love for His word through your daughter’s eyes makes me want more of His word. Thank you! This is such a cute story. 🙂 Thanks for sharing! Just recently my grown son, now a pastor, borrowed my Bible. He couldn’t help but notice all the underlining I’ve done, and jokingly commented, “Mom, you might as well underline the whole thing!” Well, I’m with Lydia. It’s the story that laces together all the wisdom and exhortation. We need it all! Thank you, Jennifer, for once again taking a small slice of your life and serving up a banquet of encouragement! Jennifer, love this so much. I have all the Bibles I’ve ever used including my first that I got in the early seventies. I was surprised to look at it and see that I was underlining verses even at a young age. God has been faithful to me for many years. – Also, I messed up my link and had to link up a second time. Sorry! Love it! Marking our Bibles gives us a chance to record our reactions to His Word. Thanks for the great post & for hosting & God bless! Even the scary parts are still God’s Word. I enjoy the promises best, but don’t leave out the frightening parts either. Jennifer, I was sitting here at my desk tonight, listening to Amy Grant’s Better Than A Hallelujah, when I opened this post. All I can say is laughter and tears – all at once. Better than a hallelujah for sure. God bless your sweet Lydia.